OK, this isn’t my best work, but I wanted a lighted tree and this is the only way I could get one that would last more than a few days with an active cat in the house. No balls to bat, no branches to climb, no real tree to come crashing to the floor. Probably the best part of this project is that it didn’t require a trip to the store for anything – and by sitting the tree with its wet paper mache, just one layer, in front of the heating vent from the furnace, it dried in a few hours and the whole project was done in just one day. Besides, with over a foot of snow outside and the temperature dipping well below zero, it was a perfect day to stay inside and make something. Keep warm! 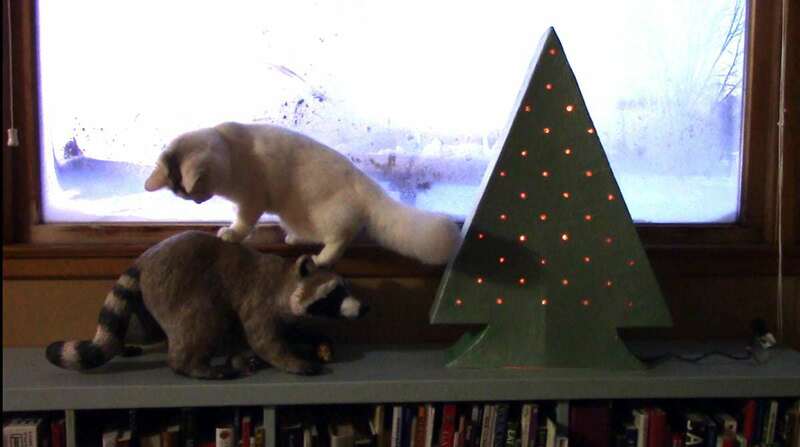 And I just found this video of other cat-proof Christmas tree ideas – funny! I definitely need to keep an eye on you! A co-worker of mine has been begging me to do a Christmas tree for her for two years. I asked her if she wanted a snowman, and she said that would be better than a tree. I just never could figure out how to make one, and here you have done it. Well, maybe next year when you give us “better” instructions! lol. Your tree is charming! I am primarily a painter so I love the idea of the “blank canvas” and all sorts of ideas for surface decoration sprang into my head immediately! I have had a cat tip a large tree full of lights and ornaments over completely, and I had one cat who loved to just carefully climb up in the tree and hang out there, deep in the branches without knocking anything over. Your little tree has sleek ” mid century” lines. Very nice! And you are, as always, SO CREATIVE. A pleasure and inspiration to watch. Thanks, and have a very Merry Christmas!??? Those question marks after ” Christmas” we’re supposed to be little Christmas tree emoticons!!!! Merry Christmas to you, too, Julie. Enjoy! Super simple but sweet! Your new kitty has quite the personality, you must bring out the best in your cats because they all seem to be such characters! I actually have an idea for next year. Why not hold a competition for the best simple Paper Mache Christmas tree. It could be just for fun or it could be a fund raiser for this blog. You would need to present it probably after Halloween or you could do a Christmas in July sort of thing. The winner could get 1/2 of the proceeds or one of your sculptures???? Excuse me while I think out loud. Just an idea. I would do it and I am sure Shelbot, Christine, Rex, Susan, Dazz, Marilyn, Nancy, Suzanne, Joyce, Carrie, Kuriologist and many more(you get my drift) would help out! Think on it! In any case, enjoy your Christmas, stay warm. Not a good time for the thermostat to go out! You are not alone, my oven went out just in time for no Christmas cookies to be baked! That’s a great idea! (Although, since I haven’t been selling any sculptures, I’m not sure “half” would be very exciting… 😉 ) what’s coming up next? Valentine’s day? There must be something going on before that. Too early to think, not enough coffee. I hope you get your oven working again soon. Cookies make the house smell like Christmas. Very nice tree, Jonni. I like it for its simplicity and it gives me idea what next to make with my grandchildren (although I’m going to see them after Christmas and New Year). You’re welcome. Have fun with the kids! I absolutely love your work! Wanted to let you know that none of the links in your email are working and your news is always too good to miss! Wow – thanks for letting me know. This is the month for tech headaches! I’ll see what I can do to get it fixed before the next post goes out. Have a great Christmas. Jonni, at first I thought that it was just too simplistic. Then I remembered that when they display what is supposed to be an ultra-chic store in a movie/TV show they often have sleek, uncomplicated forms as Christmas decor. And I’m betting a lot of people will appreciate that they can have a (hopefully) cat proof tree. But what really made my heart sing was when you started talking about all the possibilities. I hope other people make these trees and use every one of your suggestions. I would love to see those. Thanks for a great idea! Shelbot, you’re being very kind, and I, too, hope other people take more time and do this up right. If I went for ultra-chic, I’d make a tall, narrow tree, perhaps with a knife-edge instead of the strips of cardboard, or perhaps a cone. And I’d probably put it on a stand – a round piece of wood on the table with a black pipe going up to the inside of the peak. The lights could be wound around the pipe, and the tree would have a bit of a wiggle as people walked by. That would be fun. Someone on YouTube said that wall trees are a thing this year, and that’s a fun idea, too. Well, now I want to see your ultra-chic tree that wiggles a little. LOL But your little tree is growing on me. (There’s a joke there some where). I’m going to look up wall trees now because I’m not sure what you mean. We do our wall tree using no damage wall hooks. 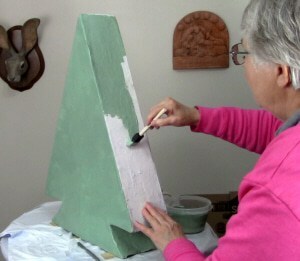 The decorations we use are generally flat and some are handmade. This is our alternative to a traditional tree and we also hang our baubles from the ceiling so the cats don’t play. This is this years one. That’s really pretty, Rachel. Thank you so much for showing me/us! Very nice of you.